Heute werden uns zwei Themen beschäftigen. Zunächst das einfachere, nämlich die Zukunft der Eurozone nach der Regierungsbildung in Italien; heute Nachmittag dann die Aussichtslosigkeit im Nahen Osten angesichts der demografischen Entwicklung in der Region, die alles verspricht, nur keinen Frieden. Beginnen wir mit Italien. Da reagieren demnächst ausgesprochene Euroskeptiker, um nicht zu sagen -gegner, und es passiert nichts. Die Zinsen bleiben tief, der Euro gewinnt gar zum ersten Mal seit Tagen wieder gegenüber dem US-Dollar dazu. Alles paletti also? Natürlich nicht. Was sich dort anbahnt, hat das Zeug, den Euro innerhalb der nächsten zwei Jahre zu vernichten. Nein, das ist keine Prognose. Da halte ich mich daran, entweder das Ereignis oder den Zeitpunkt vorherzusagen, aber niemals beides zugleich. „The formation of such a government – which could still unravel at the last moment – will stiffen German resistance to any form of EMU fiscal union or debt pooling. It effectively dooms the Macron plan for a eurozone budget, leaving monetary union almost unworkable in the next global downturn.“ – bto: Das stimmt. Wenn es eine neue Rezession gibt – und die ist nur eine Frage der Zeit –, hat die Eurozone außer der EZB nichts zu bieten, was die Region, die fundamental völlig aus dem Ruder läuft (es gibt keine Konvergenz, sondern zunehmende Divergenz! ), nicht auf Dauer „retten“ kann. „Earlier proposals by the two parties included the creation of a parallel currency or „fiscal certificate“. The more sophisticated Lega variant would be based on perpetual treasury notes to cover €70bn (£61bn) of tax rebates and funds owed to state contractors. It is a way to inject liquidity into the economy, and to reintroduce the lira by stealth.“ – bto: Die Parallelwährung habe ich auf bto schon im Oktober 2017 diskutiert. Ich finde es SUPERsmart und denke, es wird der Weg sein. → Kommt in Italien die Parallelwährung? Dazu der Telegraph richtig: „The scheme would – if ever enacted – subvert the monetary control of the European Central Bank and destroy German political consent for the single currency. It ultimately renders the euro structure untenable.“ So ist es. „It is a hazardous moment for Italy to start awakening the global bond vigilantes. The ECB is to wind down its debt purchase programme by the end of the year, depriving the Italian treasury of a backstop buyer for its debt. The country has to refinance debt equal to 17pc of GDP this year, one of the highest ratios in the world.“ – bto: Es wird eben klar, dass der Euro zu Ende ist. „The markets have so far reacted calmly. Risks spreads on Italian 10-year bonds have risen just 18 basis points to 138 over the last week, but this may prove complacent.“ – bto: Warum wohl? Wir wissen es! Es gibt einen mächtigen Freund in Frankfurt, der nicht Geldpolitik betreibt, sondern Euro-Schulden-Sozialisierungs-Politik durch die Hintertür. Konkreter: „A study by HSBC concluded that the ECB has mopped up half the gross supply of Italian debt during the QE phase and shaved at least 100 basis points off Rome’s borrowing costs, flattering the fiscal profile. The underlying picture has been deteriorating, adjusted for the cycle. The economy looks stronger than it is because a depreciation allowance of up to 250pc led to a temporary surge in investment, drawing forward fiscal stimulus from the future.“ – bto: Dazu wurde Geld geschaffen, was auch bei uns gilt. Nur so zu Erinnerung. Da ist es doch sofort klar, weshalb die Märkte positiv reagieren. Der Euro ist sicherer geworden, weil Eurogegner demnächst regieren, muss doch die EZB noch mehr tun, um ihn zu erhalten! „Mr Salvini has concluded – after watching the Greek fiasco – that it is too dangerous for a debtor country to leave the euro alone, but he has not altered his view that monetary union is the work of the devil. He has merely shifted tactics. The Lega now aims to bring about ‚Italexit‘ by subtle means, subverting EMU from within. ‚The euro is and remains a failure. It is clear in our minds that the system of monetary union is destined to end, and therefore we wish to prepare for that moment,‘ he said. “ – bto: Es geht also darum, die Eurowährung als Ganzes zu beenden (zumindest in der heutigen Form) und das so, dass die Schuldfrage bei jemandem anderen hängen bleibt. Na, schon eine Idee? Zunächst also die bereits angesprochene Parallelwährung: „These preparations are sketched into the Lega – Grillini document. It calls for a study of “minibots”, perpetual treasury notes used to inject liquidity, initially by covering €70bn of state arrears to households and contractors.“ – bto: Übrigens eine wirklich gute Idee, nicht ganz so weit weg vom Wolffson-Plan. „While there is no public clamour for the lira, there is no love for the euro either. It is widely felt that monetary union is a German regime that has trapped their country in a bad equilibrium, depriving them of the sovereign tools needed to confront the post-Lehman slump and to protect their banking system.“ – bto: Natürlich wird uns Deutschen keine gute Rolle zugedacht, was vor allem an der verfehlten Politik der Regierungen unter Frau Merkel liegt. Also, Erpressung, die wir nicht mitmachen. Ich denke ja, Frau Merkel und Co. werden sich für Europa auch wegen der Migrationsproblematik in jeder Hinsicht erpressen lassen. „Should we be worried? The answer is yes, but not for the reasons widely assumed. Italy’s new leaders have studied carefully the confrontation between Greece and the rest of the eurozone three years ago. They will not start their period in office by breaking the EU’s fiscal rules. They will not threaten to leave the euro. But we should think of this as a tactical retreat. None of the problems for Italy in the eurozone have been solved. There will be no big structural reforms, and no material reforms in eurozone governance either.“ – bto: Genau, so ist es! „The two parties campaigned on a platform of radical change to Italy’s economic and social policies and on immigration. The League wants a flat income tax. Five Star campaigned on a universal basic income. Both parties want to undo the pension reforms of 2011. The League wants a feasibility study for a “mini-BOT”, a debt instrument secured on future tax revenues that should be acceptable as a means of payment — in other words, a parallel currency. Think of it as a way to exit the eurozone without exiting the eurozone.“ – bto: brillant und richtig! „There are two ways for the new government to meet the targets. The first is to water down the election promises, the second to implement them later. The first would risk a breach with the voters, the second a battle with the EU. The coalition would have to do both. (…) Five Star and the League would self-destruct if they failed to deliver what they promised to their voters. The most likely policy evolution of this administration would, therefore, be a period of reluctant compliance with EU rules, followed by three conflicts.“ – bto: Es dauert noch einige Zeit, aber es wird kommen. „Italy will ask for a change in the European treaties. I am certain that the EU would reject such a request. We should perhaps stop obsessing about whether Emmanuel Macron and Angela Merkel can agree eurozone reforms: the French and German leaders probably will. But I doubt whether they can co-opt the new Italian prime minister into a deal if they reject Italy’s request to relax the fiscal rules.“ – bto: Wir machen es, aber nicht die Holländer. Danke dorthin! „The second is the so-called mini-BOT. Five Star is notably cool on the idea, but the League sees it as a useful way to circumvent fiscal rules. The idea failed in Greece through lack of preparation. But if it is technically feasible, the political temptation in this case would be overwhelming. For as long as Italy refrains from calling it a parallel currency, I see nothing the EU can do to block it.“ – bto: Wann hat die EU schon was blockiert, wenn es um Geld ging? Siehe Staatsfinanzierung in Irland durch die Notenbank. Hauptsache die Gurken haben die richtige Größe. „It would be naive to think of the election of two anti-establishment parties in the eurozone’s third-largest economy as immaterial. 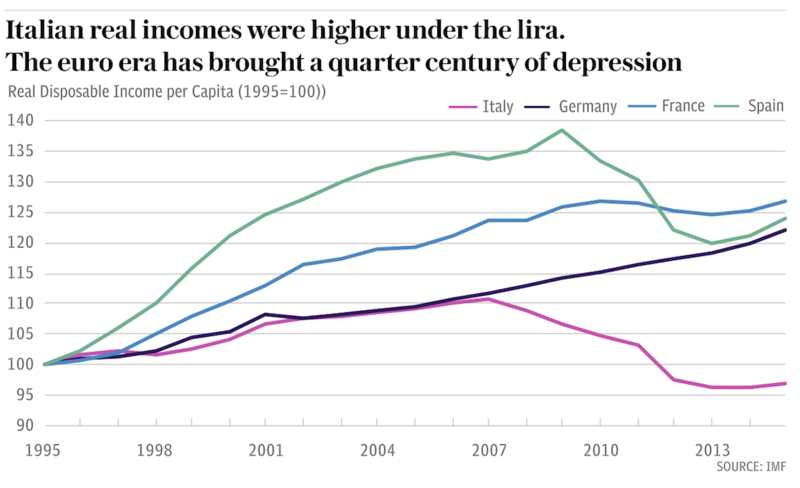 Italy after all is not Greece. And the League and Five Star constitute a far greater challenge to the EU consensus than Syriza.“ – bto: stimmt! 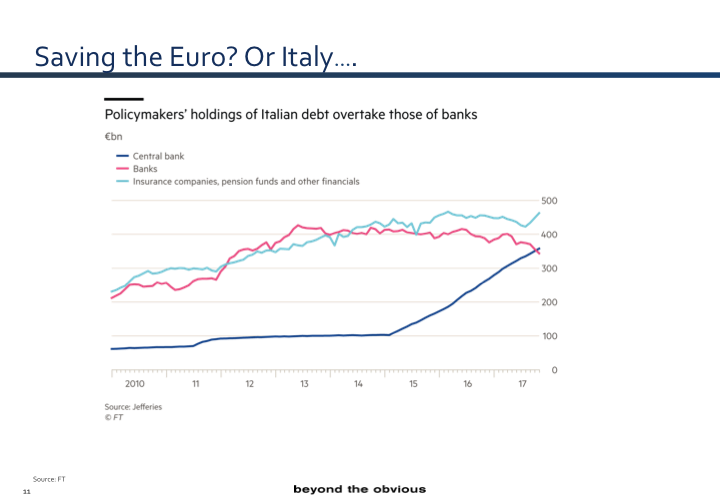 Ach wie gut, dass der Maestro selbst weiß und sagt, weshalb es schiefgehen wird: „The worry is that Italy has continued to suffer chronic capital flight even during the economic recovery. The proceeds from QE have been recycled out of the country into accounts in Germany or Luxembourg. The Bank of Italy owes €426bn to its ECB peers through the internal Target2 payment system. This was supposed to self-correct. It has not done so. Alan Greenspan, former chairman of the US Federal Reserve, said the Target2 imbalances show that the architecture of the euro is ‚not conceptually stable‘ and he is watching the figures closely. ‚It’s something that’s not going to work out well,‘ he said.“ – bto: „conceptually unstable“! So muss man das Desaster mal benennen! Einmal abgesehen von der Frage, wie lange man diese zum Scheitern verurteilte Fehlkonstruktion als deutscher Steuerzahler noch zwangsfinanzieren muss und in welcher Höhe, mag man sich gar nicht die Frage stellen, wie das Ende aussieht. Denn dieses wird für Deutschland nicht nur eine finanzielle Katastrophe an sich, sondern eine unfriedliche obendrein. Oder woraus soll sich die Hoffnung begründen, dass sich der EU/Euro-Sozialismus, der zu den bekannten, immensen Schieflagen in vielerlei Hinsicht geführt hat (immer mehr Divergenz anstatt der angestrebten Konvergenz!) einfach so friedlich auflöst? Da erscheint die Frage, wie man sich auf dieses Ende vermögenstechnisch am besten vorbereitet, schon fast nebensächlich. Mit den deutschen Altparteien wird natürlich abgerechnet, was sonst. Die Krise wird aber noch viel tiefer gehen, denn wo war bspw. das Bundesverfassungsgericht? Hat es nicht auch schon lange versagt? Mit welcher Legitimation will man so eine Institution dann eigentlich aufrechterhalten? Das Bundesverfassungsgericht spielt schon länger eine unrühmliche Rolle, sei es beim Euro, der Migrationswelle oder dem Rundfunkbeitrag. Das Bundesverfassungsgericht ist doch schon längst zum Arm der Berliner Politik geworden. Ich denke es wird etwas Bereinigendes haben und nach einer kurzen Periode der Unsicherheit wird man auch sehen wie auch die Südstaaten mit eigener Währung wieder auf die Beine kommen. Wir können dann wieder günstig in den Urlaub fahren und können wieder optimistischer in die Zukunft blicken (meiner Meinung nach). @Jaques: natürlich versagt das Bundesverfassungsgericht. Aber wie sagten schon die alten Römer: „Quis custodiet custodies?“ Wer bewacht die Wächter? Es ist wie mit den Prätorianern im alten Rom. Haben sie – um einen alten Ausdruck zu bemühen – Ehre im Leib oder nicht? Natürlich werden Verfassungsgerichtsposten schon lange politisch besetzt und nicht nur nach Qualifikation; das Politische wird nur immer wichtiger. Aber das alleine reicht nicht als Begründung für die Euro-Entscheidungen. „Iudex non calculat“, Richter rechnen nicht, ist nicht umsonst eine andere alte Weisheit. Die Damen und Herren haben tatsächlich Angst vor fundamentalen Entscheidungen. Ich hätte das an deren Stelle auch. Können Sie sich ausmalen, wie die Märkte reagieren würden, wenn das BVerfG feststellt, dass die Zustimmung des Bundestags zur Griechenlandhilfe u.ä. die no-bail-out-Klausel verletzt und die EZB ihre Kompetenzen überschreitet? Letztes Zitat: „All politics rests on opinion.“ Auch Verfassungsgerichtsurteile sind faktisch eine Art Politik. Und solange die Bevölkerungsmehrheit zu phlegmatisch ist, ändert sich nichts. Ein Staat kann seine Existenzvoraussetzung nicht herstellen, wie ein Rechtsphilosoph aus Karlsruhe sinngemäß mal gesagt hat. Und genau das ist das Problem. Entweder das Volk tut es langfristig gesehen selbst oder niemand wird es tun. Und genau diese Aushöhlung des Rechts bzw. das Ignorieren des Rechts von staatlicher Seite und Institutionen wie die EU wird uns noch treffen. Für was eigentlich Regelungen wenn sie sowieso nicht eingehalten werden? Ich denke die Politik hat noch nicht erfasst welche tiefen Spuren dies in den Gesellschaften hinterlässt, vor allem über so einen langen Zeitraum! Es ist ja nicht so das man dies einmal über eine kurze Zeit tut, sondern es ist eine chronische Krankheit und wie Lincoln schon sagte, kann man nicht das ganze Volk die ganze Zeit über belügen. Was Sie sagen, ist auch meine Meinung. Eine Handvoll Richter gegen eine GEWÄHLTE Regierung mit derartigen Konsequenzen ist ein nahezu übermenschliches Verlangen. Und – auch eine Überlegung, aber nur eine Überlegung – in einem gewissen Maß wäre es auch „diktatorisch“, selbst wenn ein solches Vorgehen rechtlich gut begründet wäre. Das BVerfG hat der Regierung bezüglich der Verschuldung Deutschlands schon einen Riegel vorgeschoben. Denn die Regierung MUSS sich vom Parlament ein mehrheitliches O.K. holen, wenn sie Verträge schließen, etwa Kredite des ESM an Griechenland mit genehmigen will, die den deutschen Haushalt belasten würden bei einem Schuldenschnitt bzw. einer Insolvenz. Merkel agiert nicht nur mit Fesseln, aber auch mit Fesseln. Es hätte uns aber auch getroffen, wenn das Recht durchgesetzt würde – nur anders. Und in bestimmten Situationen kann die Durchsetzung von Recht auch für alle Beteiligten sehr schmerzliche Folgen haben. URSÄCHLICH liegen die Dinge anders. Die Leute kümmern sich NICHT um die Einhaltung des Rechts. Keine Regierung wird für RECHTSBRUCH sanktioniert, wenn kein erlebbarer bzw. zuordbarer Schaden damit verbunden ist. Die Bevölkerung IST das Problem. Die BEFOLGUNG des Rechts muss FORTWÄHREND durch sie gesichert, d. h. ERFOCHTEN werden im öffentlichen Diskurs. Es genügt nicht, dass Rechte und Pflichten für die Regierung bestehen. Sobald Italien eine Parallelwährung offen oder verdeckt einführt, wird es Nachahmer geben. Frankreich, Griechenland und Spanien fielen mir da ein. Aber auch die Niederlande und die osteuropäischen Staaten, die den Euro als Währung haben würden nachziehen. Ganz zum Schluss würde auch Deutschland dann und endlich den unvermeidlichen Schritt tun. Vorher aber sicher noch „europäische Haltung“ zeigen und damit den wirtschafltich/finanziellen Schaden für Deutschland maximieren. Wir werden sehen, ob diese Einschätzung zutrifft. Die EZB wird Italien genauso mit Geld fluten, wie die Wall Street das Fracking. Die Ziele und Methoden sind die Gleichen, nur die Inhalte unterscheiden sich. Für die EU wird es aber immer schlimmer. Trump versucht die EU von Märkten und Rohstoffen abzuschneiden. Iran, Russlandsanktionen, China-Zölle etc. sind klassische Beispiele. Total muss nun schon mit Rosneft ein Zwei-Jahresvertrag für Öl-Lieferungen über die Druschba-Trasse nach Europa abschließen. neue Innen- und Außenpolitik praktiziert wird. Die kommende EU-Datenschutzgrundverordnung gibt aber dazu wenig Hoffnung. Es ist schwierig, die Entwicklung im Augenblick richtig einzuschätzen. Die neue Regierung muss liefern, wenn sie an der Macht bleiben will. Der Staat wird sich daher mehr verschulden. Das gesamte avisierte Ausgaben-Mehrpaket wird auf 100 Mrd. EUR/Jahr geschätzt. Das ist in Euro möglich, wenn die EZB bei QE und Niedrigstzinsen bleibt. Das wird sie aber nicht bleiben können, weil sie sich nicht von weltweit steigenden Zinsen entkoppeln kann. Sie wird immer den US Zinsen folgen müssen, mit einem gewissen Zeitverzug und nicht in gleicher Höhe – aber sie wird folgen MÜSSEN. Ein denkbare Alternative ist eine Bankenunion – im Augenblick nur denkbar, weil die deutsche Regierung sich dagegen wehrt und es keine Parlamentsmehrheit zu geben scheint –, mit der die Risiken insbesondere der italienischen Banken so eliminiert werden, dass der italienische Staat sich bei ihnen in Euro verschulden kann. Ich schätze diese „Lösung“ nicht als sehr hoch ein, weil sie die deutsche Regierung in große Bedrängnis bringen würde. Merkel hält Abstand und weiß, warum sie das tut. Es gibt aus Sicht der neuen Regierung gute Gründe dafür, eine Staatsfinanzierung mit einer „Fiskalwährung“, die vom Euro entkoppelt wird, einzuführen. Naturally, the existence of fiscal money can constitute a first step for a state to leave the euro system if at a certain point the fiscal money is declared legal tender instead of the euro. The Emission of fiscal currency comes with a risk: it could be the end of the euro. However, the real risks of the end of the euro result from the design flaws of the Eurozone and are not created by the emission of fiscal money. The Eurozone problems already exist and will continue until the ongoing dysfunctions are fixed, dysfunctions that the fiscal money helps to overcome. Wenn die „Fiskalwährung“ funktioniert mit einer positiven Entwicklung auf dem Arbeitsmarkt u. a., wird Umstellung und Austritt ERKLÄRT. Wenn nicht, ist das Land in einem schlechteren Zustand als heute und dann ist m. A. n. mit einem POLITISCHEN statt mit einem währungspolitischen Austritt zu rechnen. Es wird meiner Meinung nach keinen Austritt Italiens aus dem Euro geben. Und wenn schon: Asche zu Asche, Staub zu Staub. Davon wird die Welt nicht untergehen.